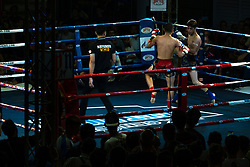 Muay Thai or Thai boxing is a combat sport of Thailand that uses stand-up striking and various clinching techniques. In Western boxing, the two fighters are separated when they clinch; in Muay Thai, they are not. It is often in the clinch where knee and elbow techniques are used. It is known as the "art of eight limbs" as it is characterized by the combined use of fists, elbows, knees, and shins. as opposed to "two points" (fists) in boxing and "four points" (hands and feet) used in other more regulated combat sports, such as kickboxing and savate. 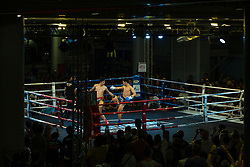 Muay Thai started to become widespread internationally in the 20th century. It became enterainment in Thai restaurants, such as the Busabong in London. The history of Muay Thai can be traced to the middle of the 18th century. During the battles between the Burmese of the Konbaung Dynasty and Siam, the famous fighter Nai Khanomtom was captured in 1767. The Burmese knew of his expertise in hand-to-hand combat and gave him a chance to fight for his freedom. Nai Khanomtom knocked out ten consecutive Burmese opponents. Impressed by his skill, the Burmese freed and allowed him to return to Siam. He was acknowledged as a hero, and his fighting style became known as Siamese-Style boxing, later known as Muay Thai. Muay Thai soon became recognized as a national sport. Spectators went to watch. Contests gradually became part of local festivals and celebrations, especially those at temples. The previously bare-fisted fighters started wearing lengths of hemp rope around their hands and forearms. 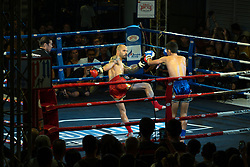 A practitioner of Muay Thai is known as a Nak Muay. Western practitioners are called Nak Muay Farang, meaning "foreign boxer". King Chulalongkorn (Rama V) ascended to the throne in 1868 and introduced a golden age for Muay Thai. The king had a personal interest in the sport. Most professional Thai boxers come from the lower economic backgrounds, and the fight money (after the other parties get their cut) is their sole means of support and their families. Due to the rigorous training (some Thai boxers fight almost every other week) professional boxers in Thailand have relatively short careers. Many retire from competition and teach the next generation of Thai fighters.